A trick-shot game where corners and objects are used to assist shots made from a distant, fixed location, RunningDead is essentially Breakout without the paddle to save the "ball" from falling into the pit. So... how do you prolong the experience if the ball, in this case a zombie, is guaranteed to stumble down the hole every time? There's unlimited tries, with the catch being the "bricks" you need to destroy, which are running humans here, gradually push their way down the screen every time you use up a turn. Failure to prevent one human from crossing the border at the bottom ends the game. Simple enough, though maybe a bit too simple-sounding for some. Even if you manage some solid hurls and heaves that bounce around and kill several humans in the process, it comes off sounding like a product that gets stale and repetitive pretty quick, no? Well, the game has a surprising bevy of mechanics and gimmicks, ensuring you'll have some "lengthy" sessions if they're used correctly. The numbers on humans' shirts, for instance, aren't just for fashion points, but are how many hits they can take before dying. Additionally, killing several humans with a single hit is possible if multiple same-colored shirts are bunched together, because destroying one dooms them all. As evident, strategy stretches beyond just aiming and hoping for the best; in most situations, you legitimately have to plan what specific humans need to be struck in order to clear the field faster, which makes aiming all the more crucial. A vital item that occasionally pops up on the field, a level-up syringe, allows your zombies to cause more damage, not to mention another item, a barrier, temporarily closes the pit, permitting more chances to kill humans. Those are just the default items, too, as there are better, stronger items and upgrades available for purchase once enough coins are gathered from murdering people and making slick shots. 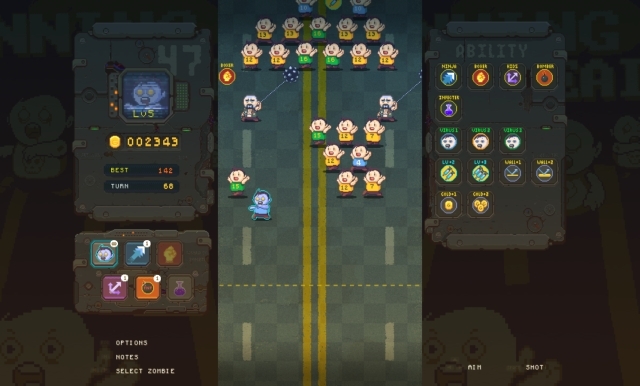 Such items enable you to phase through humans while hitting them in a boxing outfit, making the pit barrier last longer, and one power even launches a three-way shot in the form of three punk-rock zombie kids. Holding on to these items instead of wasting them on immediate, successive turns is key to your long-term survival, and in the right circumstance you'll make some visually-explosive plays. Say you've been securing a three-way shot item, but then an opportunity arises: you spy a pit barrier item creep in on the top right side of the screen. It's in a tight spot, one that needs an absurdly accurate shot to hit. You succeed, and not only do you activate the barrier, but the zombie kids are rapidly bouncing horizontally, killing numerous humans before even touching the barrier. Soon, your three zombies mount to six. How? There's a purchasable item that grants a 15% chance of a human turning into a zombie when struck, thus adding an extra to the fray when their health is gone. These new items and methods lead to longer sprees, and in doing so, create chances for encountering actual opponents. The first and likely most irritating of the gang are sleeveless, jacket-wearing guys who rapidly swing spiked balls. One touch and your zombie turn ends there, so make your shots count when they're around. Then there are police wielding shields that act as extra hits, horizontal laser beams which can only be destroyed in corners, and even clowns who love jumping over zombies. You thought killing normal humans was enough pressure? Try doing that while also contending with these eccentric challengers. As you probably deduced by now, a lot of surprising effort has been put into a game with such a straight, basic template. 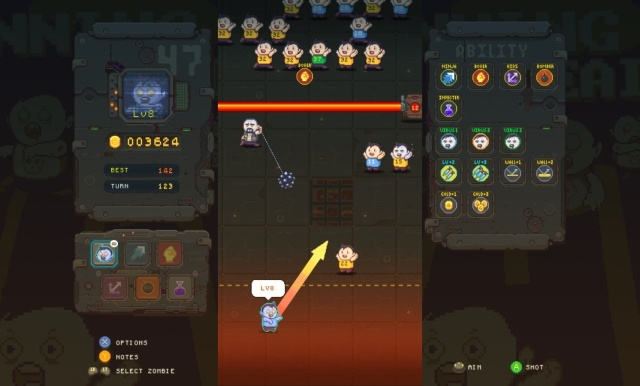 At first, I had huge doubts that RunningDead's concept could maintain longevity without succumbing to repetition, even as it gradually introduced interesting ideas into the mix. And after spending time with it, seeing the game open up further with more unique gimmicks... I've come to the conclusion that my suspicions have sadly come true. One of RunningDead's glaring flaws is that a lot of the engaging stuff isn't immediately available, because of the need to buy them. This itself isn't bad, as long as the core game manages to still entertain while you're gathering enough coins to purchase improvements. Regrettably, RunningDead's foundation has weak legs, as you won't get very far without said abilities, due to an increase in humans with large chunks of health overwhelming the field; your feeble zombies can't keep up. In turn, this forces constant easy and quick defeats as you're playing the game for the first dozen or so times, and there's really no other option than to brute force the loses for the sake of grinding coins. On a grimmer note: grinding is a pain. Everything feels like they're intentionally working against you for the sake of artificially lengthening the experience. You don't get very many coins per session, which is downright morbid when you find out items are expensive and the cost of subsequent products rise every time something's bought. You finally collected 2000 on that one item? Great, now grind 3000 coins for the next one. The time spent grinding for a lone item or upgrade doesn't even feel worth the trouble, as those abilities, while helpful, only makes for the tiniest of progress... and then it's back to grinding. The worst part? The game actually offers two upgrades for amassing more coins per playthrough... and it's still not enough to lessen the grindfest. Ludicrous, since items cost as much as 6000 coins later on. You'd think the game would, in some way or form, improve once most items are unlocked, since you now have the opportunity to experience more of RunningDead. However, the exact opposite happens as you realize there isn't a lot to this game, that there's only so few varying enemies or scenarios, and how grinding was inserted simply to stretch out its few gimmicks to give the illusion of a long, productive experience. RunningDead doesn't have a terrible premise, and it does have some genuinely thoughtful mechanics and ideas for a game of this nature. It's just very unfortunate the execution makes everything feel artificial and stagnant. At the very least, it works as a quick, quick pick-up-and-play title, but there are so many other games out there that does that shtick better. If you enjoyed this RunningDead review, you're encouraged to discuss it with the author and with other members of the site's community. If you don't already have an HonestGamers account, you can sign up for one in a snap. Thank you for reading! None of the material contained within this site may be reproduced in any conceivable fashion without permission from the author(s) of said material. This site is not sponsored or endorsed by Nintendo, Sega, Sony, Microsoft, or any other such party. RunningDead is a registered trademark of its copyright holder. This site makes no claim to RunningDead, its characters, screenshots, artwork, music, or any intellectual property contained within. Opinions expressed on this site do not necessarily represent the opinion of site staff or sponsors. Staff and freelance reviews are typically written based on time spent with a retail review copy or review key for the game that is provided by its publisher.